Misfortune dogged Subhashini Mistry from the moment of her birth. She was born during the Bengal famine that drove impoverished farmers to starvation and death across the countryside. Her father, a marginal farmer who owned a tiny patch of land in Kulwa village about 30 kms south west of Kolkata, was unable to feed his 14 children. Her mother scoured the land, begging for rice from the churches, ashrams, NGOs, government offices and landlords of the area. Over the next few years, seven of the children died. At 12, Subhashini was married off to Chandra, an agricultural worker who lived in Hanspukur village, a one and a half hour walk away. He earned Rs.200 a month. Subhashini struggled to make ends meet, cooking and cleaning all day long for her husband and four children. Disaster struck in 1971. 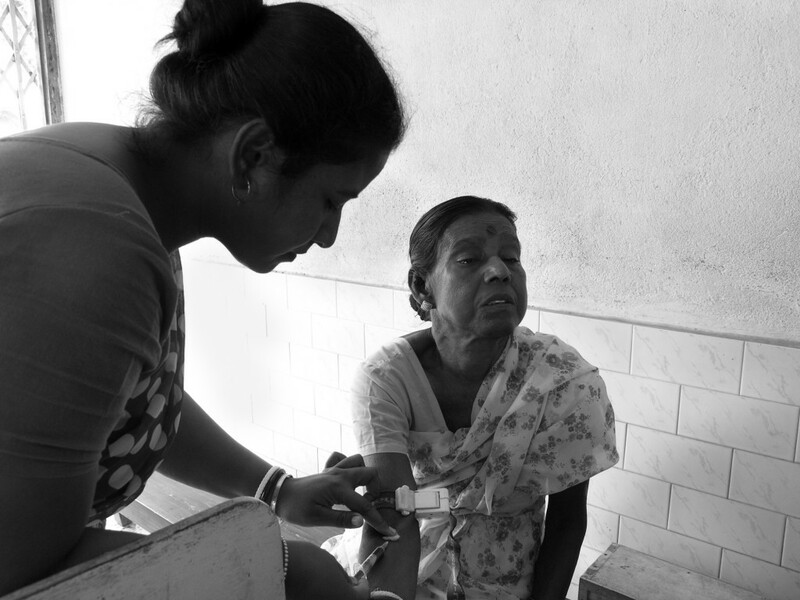 Her husband began writhing in pain and she rushed him to the district hospital in Tollygunge, Kolkata. The anxiety over her husband’s deteriorating condition gave way to horror as she realized that the doctors and nurses refused to pay any attention to him because he was penniless. 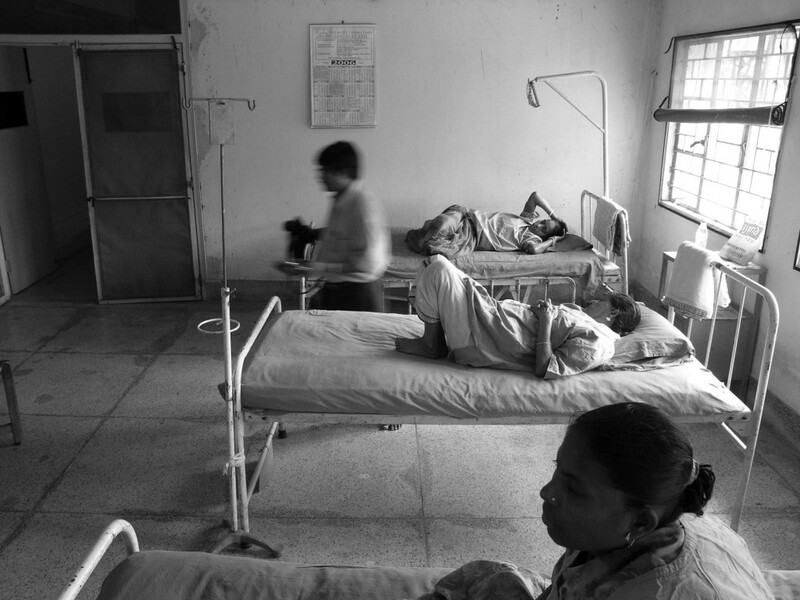 This government hospital was mandated to provide free service to the poor. But reality was that patients needed either money or connections to get treatment. Death ended her husband’s torment. But that was only the beginning of Subhashini’s torment. Her husband was the sole breadwinner of the family. She was poor and illiterate with four small frightened, hungry children to raise. She sobbed over the body of her dead husband, overcome with grief and desperation. A poor, puny housewife with no education, training or skills, how on earth was she going to raise her four children, the eldest eight years old, the youngest not even two? Her parents and brothers were so poor, they could barely support themselves. Through her tears and fears, Subhashini made an oath that fateful day. No one should suffer her fate. Basic medical attention could easily have saved her husband who had nothing more than a bout of gastro enteritis. But poverty and callous hospital staff had killed her husband. She vowed she would do what it takes to spare people of this nightmare. She would build a hospital for the poor. But Subhashini did not have the luxury to indulge in either her dream or her despair. She had four hungry mouths to feed. She only knew housework, so she started working as a maid servant in five houses nearby, earning a total of Rs. 100 a month. 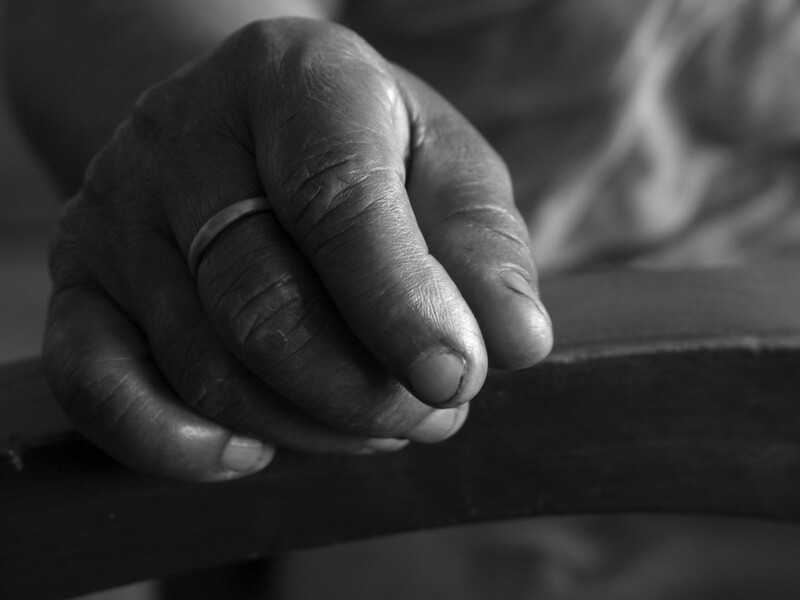 She recalls: “There is no work my hands have not done. I have cooked, mopped floors, washed utensils, cleaned gardens, polished shoes, concreted roofs.” Her son Ajoy was a good student. She sent him to an orphanage in Kolkata so he could get a decent education. The other three children helped with housework. Soon she discovered she could pick vegetables that grew on the wayside in Dhapa village and sell them. She realized that selling vegetables would fetch more money than doing other people’s housework. So she and her children moved to Dhapa village where she rented a hut for Rs.5 a month. She began selling vegetables in Dhapa village, and gradually, as her business grew, she headed for bustling Kolkata. She set up her wayside stall on bridge Number Four in Park Circus in central Kolkata. She started earning about Rs.500 a month. During the cauliflower season, she earned more. She opened a savings account in the post office and deposited a little money whenever she could. Sometimes Rs.50, sometimes Rs.200. For 20 years, she scrimped and saved. 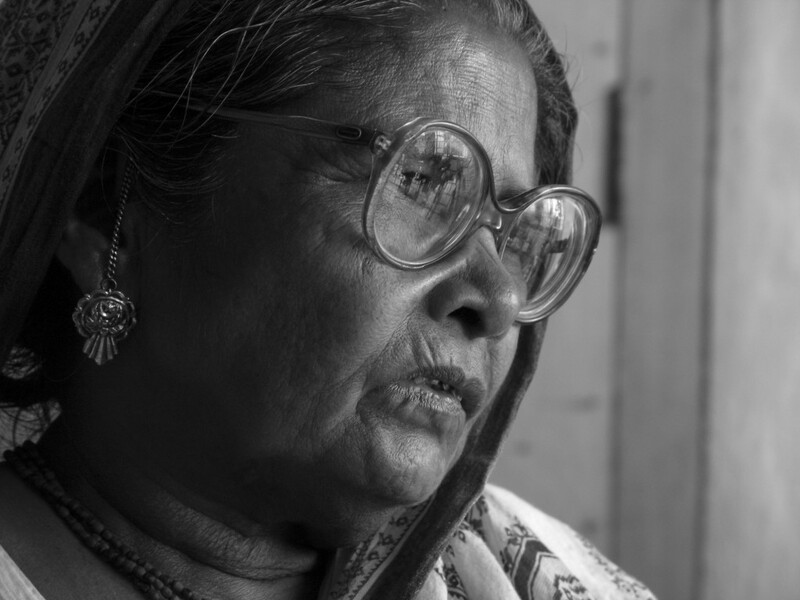 She spent nothing on herself and little on her children, except for Ajoy’s education. With the industriousness of an ant, she saved, little by little. For a purpose. She had not given up on her dream. She was determined to build that hospital. In 1992, she bought one acre of land in her husband’s village, Hanspukur, for Rs.10,000. She moved back with her children to her husband’s hut that had been lying vacant all along nearby. She gathered the villagers and told them of her plan. She would donate her one acre land for the hospital, but the villagers would have to donate money to build a thatched shed that could serve as a dispensary for the poor. The public donation totaled Rs.926. Some villagers contributed in kind – providing bamboos, palm leaves, truckloads of earth, wooden planks. The poorest offered their labour. 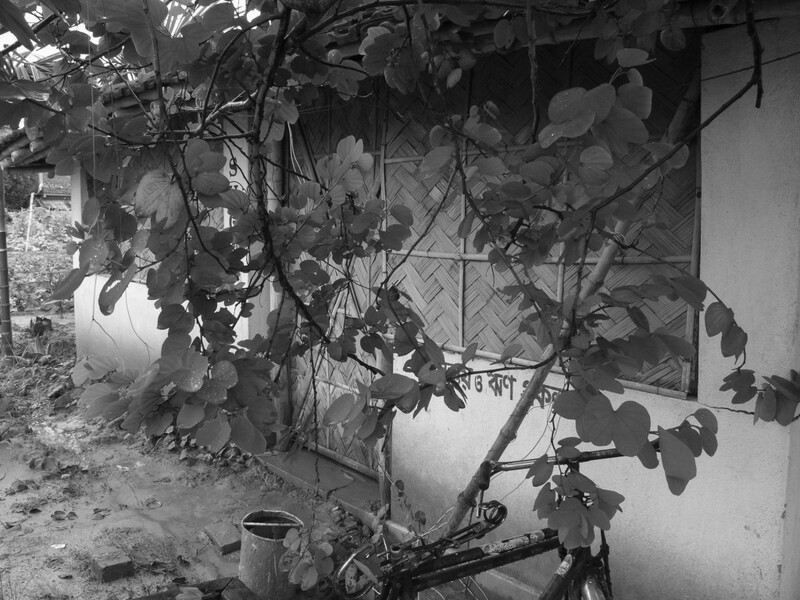 Thus, a 20 feet by 20 feet temporary shed was constructed in 1993. Then an auto rickshaw fitted with a loudspeaker plied the countryside over a 10 km radius, pleading with doctors to offer their free service at the newly opened Hanspukur shed at least once a week for the poor and needy. Simultaneously, villagers went from door to door urging residents to donate their surplus medicines. The first doctor to respond to the call was Dr. Raghupathy Chatterjee. Five others followed in rapid succession – a general physician, pediatrician, orthopedic, ophthalmologist and a homeopath. Each one of them offered free service, ranging from two to four hours a week. On the very first day, 252 patients were treated. Humanity hospital, as the little shed was named, never looked back. Not that the going was easy. Monsoon was pure hell. There was knee deep water inside the shed. The patients had to be treated on the road. So it was decided to build a concrete roof covering a 1,000 sq feet area. This required much more money. So Subhashini and her son Ajoy cast the net wider. Ajoy knocked on the door of the local Member of Parliament, Malini Bhattacharya. At first, he made no headway. The door remained firmly shut. But he persisted. Bit by bit, the door opened and finally he managed to meet the MP and explain his mother’s goal. Over a period of time, he won her over and after seeing with her own eyes Subhashini’s single minded devotion to her charitable work, Malini supported the Humanity Hospital whole heartedly. She helped them to raise sufficient funds and so the foundation stone was laid in 1993. Not a single reporter attended the event. 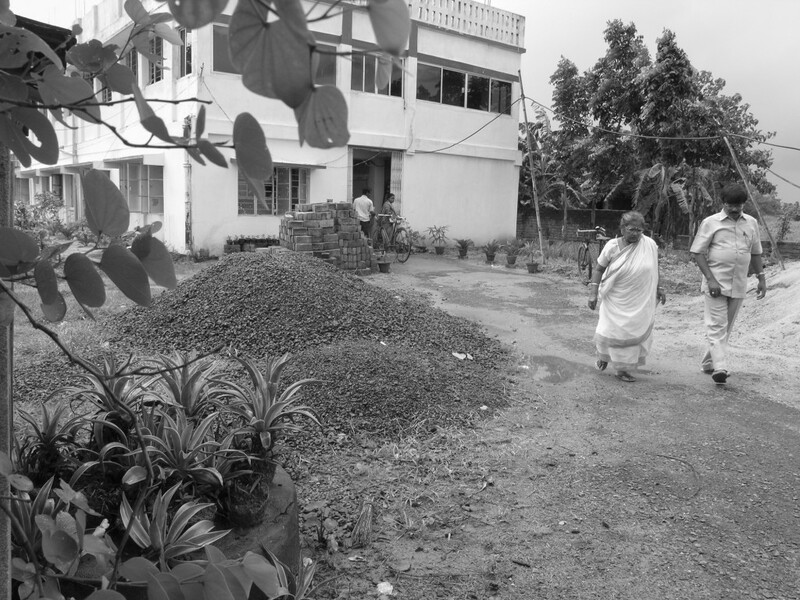 However, after the hospital was constructed, with Malini’s and the local MLA’s help, Subhashini was able to get the governor of West Bengal to inaugurate it. The governor’s presence ensured the presence of a flock of reporters. The media coverage had a healthy fall out – a trickle, though not a torrent, of donations, followed. In the meantime, Ajoy got admitted into the prestigious Kolkaka Medical College and after graduation, attended to the day to day running of the Humanity Hospital. A group of trustees – including doctors, eminent local citizens and serving IPS officers guided the hospital, which has now expanded to include gynecology, cardiology, ENT, urology, oncology, diabetology and surgery. They now have 3 acres of land and the hospital has expanded to 9,000 sq feet spread over two floors. Through all this growth, Subhashini was clear about her goal. This was a hospital for the poor. This was not a business. Yet, she knew that the hospital had to be self sufficient. It cannot survive forever on donations. So while the poor got free treatment, those who lived above poverty line had to pay Rs.10 for consultation. Still, this is not sufficient to cover the day to day expense of running a hospital. “There is a perpetual shortage of funds. We live from month to month” reveals Ajoy. With her son Ajoy at the helm of the hospital, the doughty Subhashini went back to doing what she knew best – selling vegetables, back at Bridge Number 4. She still lives in the same house. Her elder daughter and son too sell vegetables. Her youngest daughter has become a nurse and works in the hospital. 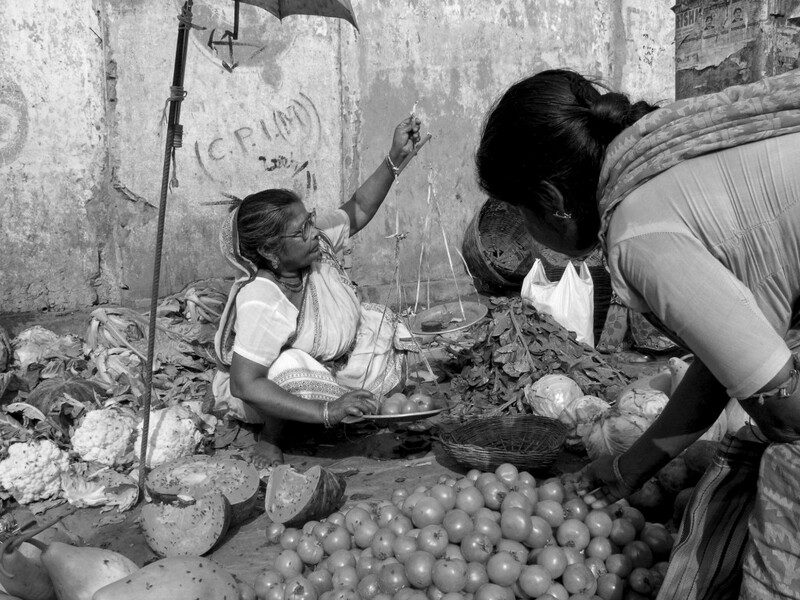 Subhashini sold vegetables in this market in central Kolkata for nearly two decades. Her daughter sells vegetables even today at this place. 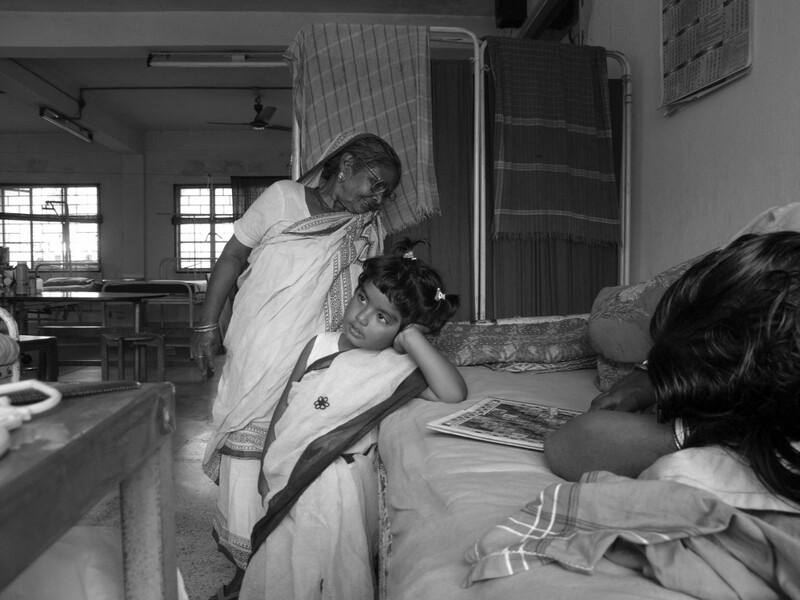 Subhashini’s grand daughter Sudeshna plays in the ward. Her laughter fills the hospital and lifts spirits of he ailing patients. A view of the ward in the old wing of the hospital. 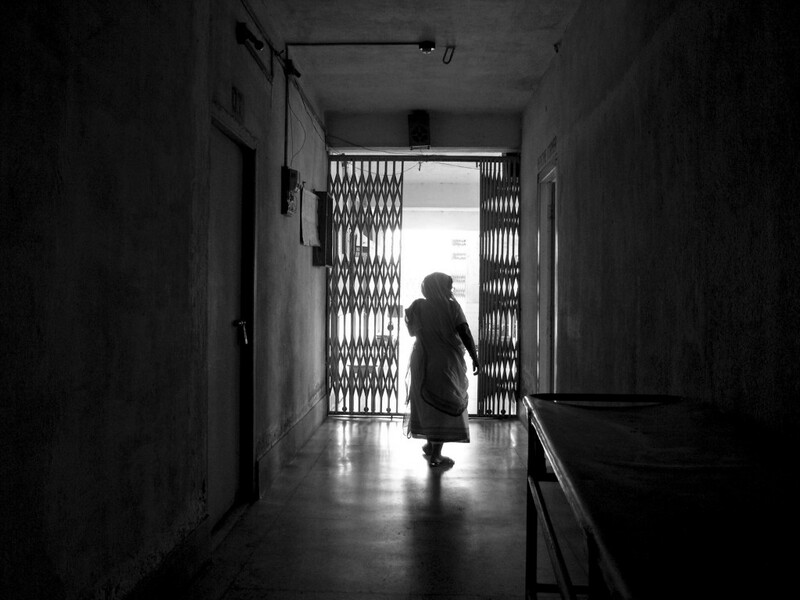 Women patients wait to be operated upon for various gynecological problems.